Nick Gibbs is UK correspondent for Automotive News Europe. Any manufacturer competing in Europe's healthy small minivan market will be inspecting the Ford stand closely at this year's Geneva auto show. Debuting is Ford's innovative B-Max, which does away with a B-pillar to allow passengers wide access into the small minivan. A combination of rear sliding doors and conventional front doors gives a 1.5-meter wide access to the cabin without, Ford says, any loss of crash safety or body stiffness. Families in Europe are expected to be big customers for the B-Max, which will not be sold in the United States, and it could be a hit with elderly buyers too. Door innovation isn't new among minivan makers. The Opel/Vauxhall Meriva was Europe's best-selling small minivan last year, with sales of 127,439 units, according to JATO Dynamics. Ford designer Erika Tsubaki demonstrates the B-Max. The Meriva has rear-hinged so-called "suicide" doors to aid access but with its B-pillar still intact, the opening is only 700mm wide. If Ford gets the rest of the B-Max package right and the model proves successful, then makers could be rushing to create their own version of a small, pillarless minivan. Ford of Romania told local newspaper Ziarul Financiar last month that B-Max production in Craiova will be 60,000 this year rising to 100,000 in 2013. 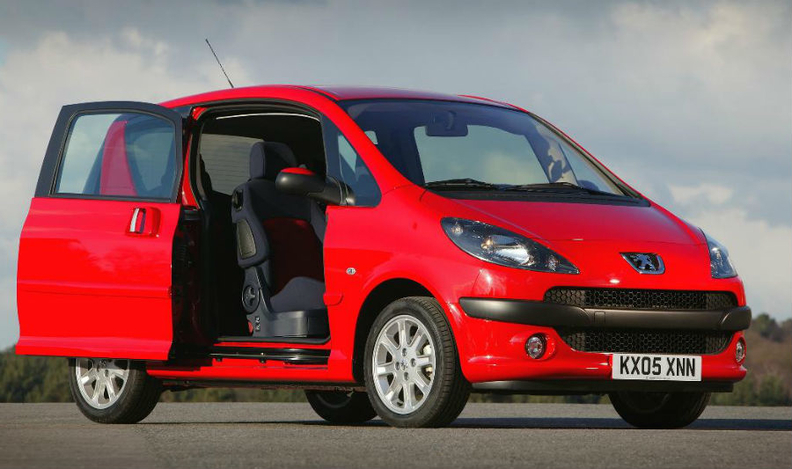 The Peugeot 1007 had an innovative sliding door system but failed in the market. But door innovation doesn't always pay off. The Peugeot 1007, launched in 2004, was meant to revolutionize the market with its twin sliding front doors that allowed easy access to the interior, even in the crowded, narrow streets of Paris. Peugeot predicted annual sales of 130,000 a year, but customers didn't take to the innovation, especially as the minivan was priced higher than competitors. By the end of 2005, Peugeot had slashed production targets for the following year to 70,000 and in 2006 that was revised to just 50,000. In 2009, it was killed off altogether and Peugeot still doesn't have a credible competitor in that that sector. Georges Chetochine, an independent marketing consultant, told Automotive News Europe in 2005 that: "People don't buy doors, even sliding ones." The 1007's sliding doors were electric, slow and prone to failing, especially early in its life. They were also the only way to get in the car, which had no conventional hinged doors. Ford will disclose how much the B-Max will sell for in Geneva. If the price is competitive, the minivan won't suffer same fate as the 1007.
Who knows, maybe the B-Max could become the new benchmark in this sector and B-pillars will be a thing of the past.